Why choose Avaza as a Freshbooks alternative? Looking to bring project management and invoicing into one platform? Avaza offers you that, and much more. Freshbooks is a market leader in invoicing and payments, and also has great features that offer time tracking and expense tracking. However, if you’re looking to collaborate with a team, you will need to buy another software subscription with it. Avaza eliminates this need. All you need, under one roof! I like that it does everything all together in one neat little package. Project management, time tracking, and invoicing… all at a great price! 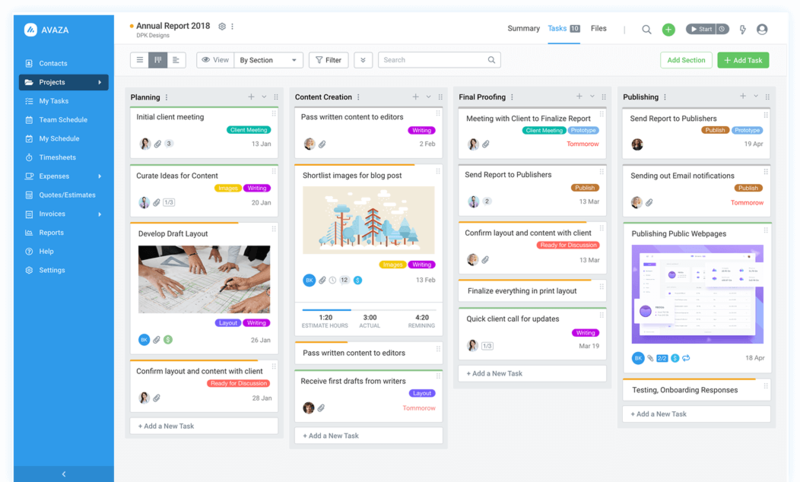 Work with tasks in the familiar list-view or more visually via side-by-side view (aka Kanban). Group tasks by section, deadline, person or task status so you are always in the know. Prioritize and organize tasks with drag and drop support. Use colorful tags for faster identification.